Vacuum Lifting Devices are typically categorized as Below-the-Hook Lifting Devices by the ASME. Manufacturers, purchasers, and users of vacuum lifting devices should be familiar with the safety standards developed for this type of equipment which have been formulated under the general auspices of the American National Standards Institute (ANSI). You will find many other countries’ standards are close to these. The American Society of Mechanical Engineers (ASME) B30 Committee on Safety Standards for Cableways, Cranes, Derricks, Hoists, Hooks, Jacks, and Slings has issued standard B30.20 for Below-the-Hook Lifting Devices. This standard addresses the proper marking, construction, installation, inspection, testing, maintenance, and operation of vacuum below-the-hook lifting devices for non-porous loads. All ANVER powered and mechanically operated vacuum lifting and manipulating devices for non-porous load handling are designed, constructed and tested in compliance with this standard. Technically all users and purchasers of vacuum lifting devices are required to follow these safety standards and have copies of these standards in their facility. We are unable to post even excerpts of this standard here due to copyright laws. However, copies of this standard are available for purchase online thru the ASME website or by phoning the ASME at (800)THE-ASME and asking for the B30.20 Below-the-Hook Lifting Devices ASME publication. Anver Vacuum Lifters fully Comply with the North America ASME Standard which applies to complete lifters for non-porous loads. Marking: A metal tag must be permanently attached with key information as the standard details. We use a aluminum tag which is engraved and riveted on to our vacuum lifters. It includes the ASME BTH-1 Design Category and Service Life which is now mandatory. Most Anver vacuum pads feature triple sealing edges as shown. 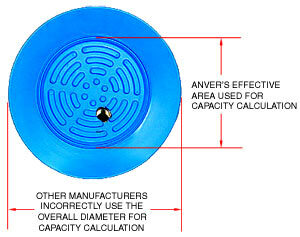 These unique Anver Safety vacuum pads greatly increase overall vacuum safety. We only use the inside area to calculate capacity so the outside ring greatly increases the safety margin. Proper detailed warning and labeling as outlined in ASME B30.20 standards. Many labels are also ISO compliant when applicable. Vacuum reservoir adds safety in case of a power failure by increasing the vacuum in a system allowing more time to safely lower the load. An instruction manual with operating procedures, maintenance and parts information. Anver’s vacuum lifter inspection check list and maintenance report forms are included in the Operation, Maintenance and Parts Manual. A test certificate can be issued upon request. A unique The VLS Safety System to monitor the vacuum level automatically and check for leaks. When vacuum leakage is detected during a lift, a loud horn sounds, and a red light flashes to warn the operator. The VLS monitors vacuum level even if the operator is not looking at the lifter. Anver VLS systems are built in to all lifters or sold as a mandated option. Anver builds its lifters with large ergonomic front and side handlebar grabs to keep the operator away from the load and ease positioning. ANVER’s adjustable handlebar extends out to provide additional leverage for the operator, and allows him to stand away from the load for greater safety. Vacuum hose with FDA approved clear PVC surrounding a steel wire helix for reinforcement. Features full vacuum rating, non-kinking/non-collapsible, clear PVC that allows visual line inspection. A glass smooth interior to reduce loss of flow. Locking vented valves eliminate residual vacuum under cups which have been shut off. If vented valves are not used it is possible to think you have vacuum under the pads when you do not. While not mandated, we feel vented valves are a beneficial additional safety feature on vacuum lifters. Our valves also have a locking mechanism to add safety. Lifter Instruction manuals and all supplemental information come on a USB flash drive. Downloadable files on the USB flash drive are compatible with both iOS and Windows operating systems. Anver designs and builds it’s Lifters to a 2″ maximum load droop or sag unless otherwise noted for sheet and plate. This increases the number of pads and beam lengths of our Lifters but it makes for safer lifting with equally loaded pads and a level load. Note: Some vacuum lifter companies design their lifters for 5″ or more of load sag (deflection) between each cup and the edge to make their equipment less expensive. This makes for a smaller vacuum lifter with fewer pads but it results in lifters where centering the lifter on the load is critical or overloading of pads can cause sudden release. Having 5″ of load sag is excessive on a long heavy plate. The 2″ max. sag Anver uses is not mentioned in the ASME standard currently but it is likely that it will be mandated in the future.